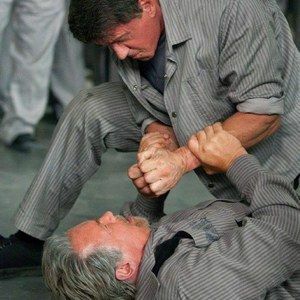 Its Schwarzenegger Vs. Stallone in First Escape Plan Clip! When Ray Breslin (Sylvester Stallone) asks Emil Rottmayer (Arnold Schwarzenegger) for a favor, it comes packed with a punch in this first clip from Escape Plan. Mikael Håfström directs the action thriller about security expert Ray Breslin, who is sent in by his employers to break out of the impenetrable prison he designed. However, when he is double-crossed, he seeks the help of longtime convict Emil Rottmayer to escape and clear his name. Needing to get into an isolation cell, these two silver screen legends duke it out in the cafeteria, in theaters October 18.